An early cover of Frank Herbert’s epic intergalactic adventure. Source: Wikimedia Commons. Frank Herbert’s Dune particularly reshaped the world of modern science fiction. This epic tale of a warring feudal society in search of a precious natural resource called spice melange, set 21,000 years in the future on a faraway sandworm-infested planet, addresses, among other things, how man-made technology affects our surrounding ecology. The book was groundbreaking, and in addition to becoming the bestselling science fiction novel ever, Dune is also credited with laying the groundwork for the Earth Day movement. The book eventually won the inaugural Nebula award as well as a Hugo, and remains in the public eye with numerous sequels, movies, and other associated tie-ins. Marking the fiftieth anniversary of Dune’s publication, the Pollak Library at California State University, Fullerton, which acquired the Dune manuscripts in the 1960s (as well as Herbert’s articles, correspondence, and research materials), is exploring the book’s contribution to popular science fiction with a speaker series called “Dune: From Print to Cinema and Beyond.” Through November 6, Fullerton faculty and guest speakers will discuss the book’s legacy and how its political and environmental messages remains relevant. Sam Weber’s Sandworm from Dune. Reproduced with permission from The Folio Society. An early cover of Frank Herbert's epic intergalactic adventure. Source: Wikimedia Commons. 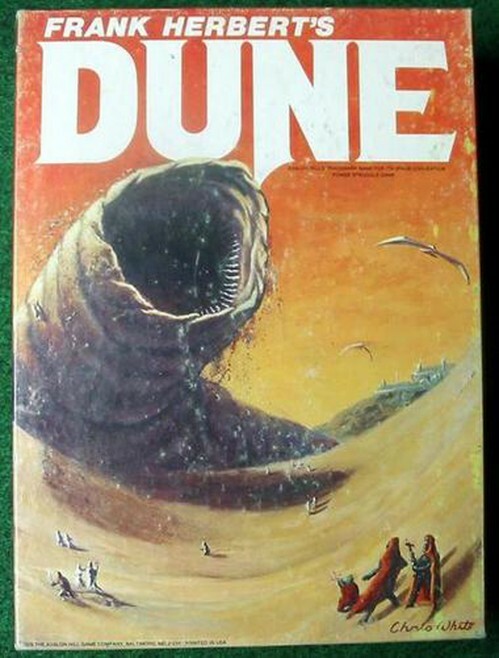 Before Star Wars, there was Dune. (Certainly, before Dune there was The Blazing World, a 1666 utopian romance by British aristocrat Margaret Cavendish, but let's stick to the 20th century.) It's all part of the science-fiction genre, and readers have long been enthralled with what author Isaac Asimov coined in 1953 as "that branch of literature which is concerned with the impact of scientific advance upon human beings." Frank Herbert's Dune particularly reshaped the world of modern science fiction. This epic tale of a warring feudal society in search of a precious natural resource called spice melange, set 21,000 years in the future on a faraway sandworm-infested planet, addresses, among other things, how man-made technology affects our surrounding ecology. The book was groundbreaking, and in addition to becoming the bestselling science fiction novel ever, Dune is also credited with laying the groundwork for the Earth Day movement. The book eventually won the inaugural Nebula award as well as a Hugo, and remains in the public eye with numerous sequels, movies, and other associated tie-ins. Marking the fiftieth anniversary of Dune's publication, the Pollak Library at California State University, Fullerton, which acquired the Dune manuscripts in the 1960s (as well as Herbert's articles, correspondence, and research materials), is exploring the book's contribution to popular science fiction with a speaker series called "Dune: From Print to Cinema and Beyond." Through November 6, Fullerton faculty and guest speakers will discuss the book's legacy and how its political and environmental messages remains relevant. Fans looking for some spice of own might consider the Folio Society's recently published $125 commemorative edition of the book, with illustrations by Brooklyn-based artist Sam Weber. Weber, you may recall, was commissioned by the United States Post Office to create stamps honoring the life and work of American writer Flannery O'Connor. The artist's 11 haunting photorealistic oil on board portraits of futuristic men and women are far from being cheesy throwbacks and evoke people whose dark struggles aren't all that different from our own. The Washington Post's longtime Book World editor (and Pulitzer Prize winner) Michael Dirda wrote the book's new introduction, calling it "more than a futuristic swashbuckler or a science-fiction 'coming-of-age' novel....It is a serious moral fable about the unforeseen consequences of the choices we make." 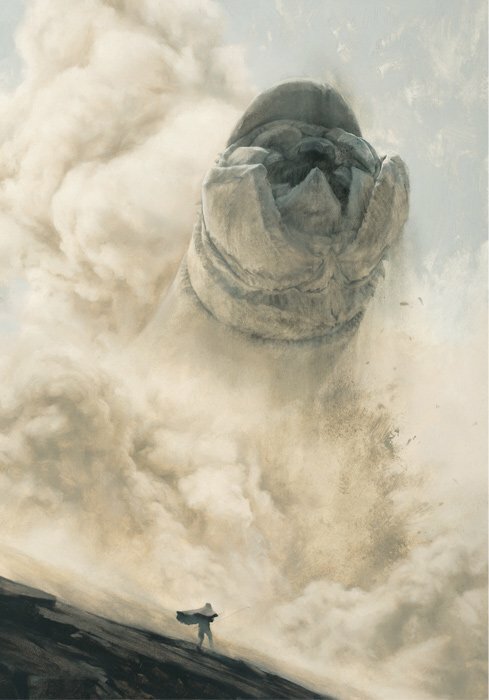 Sam Weber's Sandworm from Dune. Reproduced with permission from The Folio Society.